It may have taken them years to reach the point of admitting that there was a mutual attraction between them, but now that they have, it's time for October Daye and Tybalt to begin exploring their relationship, such as it is, and deciding what it is going to mean for them going forward. But when an old-fashioned pureblood and a modern changeling decide to court, what form can that courtship possibly take? 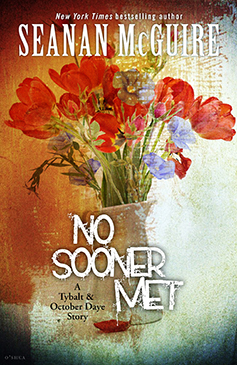 "No Sooner Met" is best read after Ashes of Honor, and contains spoilers for the series up through book six. No Sooner Met is another Tybalt POV story and it's available to download for free from Seanan McGuire's website. This book fits into the timeline after Ashes of Honor and it does contain spoilers for that book so I wouldn't recommend reading it beforehand. I spent the first 5 books praying for Toby and Tybalt to act on the attraction that was so obvious between the two of them so I was over the moon when they finally admitted they had feelings for each other in Ashes of Honor. This story picks things up just after the book ends and shows us their first proper date told from Tybalt's point of view. Of course nothing is ever simple when Toby is involved so you can't have a date without an assassination attempt but I loved they way they handled things. I just love seeing these two spending time together really and it was great to see just how important Toby is to Tybalt and the way he has been so patiently waiting for her to be ready for a relationship with him. They're still feeling their way in their burgeoning relationship but they are a ridiculously adorable couple and Quentin's little warning talk with Tybalt before the date started was hilarious. Thanks for sharing. I had no idead you could download them for free from his website. Seanan has a huge number of free short stories available on her website for both the October Daye and her Incryptid series. They're all really great so I'd definitely recommend checking them out but be careful to check the reading order so you don't accidentally give yourself spoilers!